Everyone's talking about the Moon. It'll be 50 years this Christmas since Apollo 8 first flew to the Moon – with the crew taking the famous Earthrise photos – and we're close to the 50th anniversary of Apollo 11's first moon landing and moonwalk for Neil Armstrong and Buzz Aldrin. Can we go back? Should we go back? 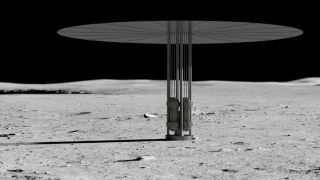 NASA knows we probably have to go back, if only to use the Moon as an off-Earth stepping stone to enable deeper solar system exploration missions, so it's spent years trying to create a nuclear reactor that can be operated there. Now it may have cracked it with the compact, mobile and super-tough Kilopower, which could enable deep space missions and human outposts on planets and moons in the solar system, such as on Mars or on Saturn's moon Titan. Kilopower is a lightweight, mobile nuclear fission reactor developed by NASA and the US Department of Energy’s National Nuclear Security Administration (NNSA). It works by splitting atoms in its uranium-235 reactor core to generate energy as heat that's converted into electricity by its high-efficiency Stirling engines. It can pump out 10 kilowatts of electrical power continuously for at least 10 years, more than twice as much as NASA thinks will be needed to run an outpost on the Moon or Mars. The tech was successfully demonstrated between November 2017 and March 2018 as part of NASA's Kilopower Reactor Using Stirling Technology (KRUSTY) experiment. If you're going to take nuclear reactors into space on crewed missions to the Moon, Mars and beyond, it had better be safe. That's what the KRUSTY test made sure of. The experiment included simulated power reduction, failed engines and failed heat pipes, and culminated with a 28-hour, full-power test that simulated a mission. It's planned to first be used on a spaceflight mission in 2020. Before you say something like 'we shouldn't be polluting space with nuclear waste', know that almost every single space mission you've even heard of has used radioisotope thermoelectric generators, which have Plutonium-238 as their electricity source. That's true for everything from Apollo and Voyager to New Horizons and Cassini. Besides, the moon's nights are long. If you've ever looked at the moon, you'll know that it always shows us the same side. One full orbit of Earth takes it 27 days, during which it rotates once, so that's effectively one Moon day. The upshot is that night-time at any given place on the Moon lasts for two weeks. Can't we use solar power on the moon? Although nights on the Moon last two weeks, there is in theory one massively efficient way to make solar power. Japanese company Shimizu has a concept to construct a massive belt of solar panels a few kilometres wide around the moon's entire 11,000-kilometre-long equator. It reckons that half of this 'solar belt' would always be in sunshine, and given that the moon doesn't have an atmosphere, so is never cloudy, solar power generation would theoretically be five times more efficient than it is on Earth. It's an on again, off again commitment that keeps changing with every new US president. The Trump administration's Space Policy Directive 1 proposes robotic missions on the lunar surface ahead of crewed missions, as well as a Lunar Orbital Platform-Gateway to help astronauts on missions beyond the moon, either going to Mars or to asteroids. NASA is asking private companies to develop new tech to deliver payloads to the Moon. The proposed Lunar Orbital Platform-Gateway (LOP-G) will be a space station orbiting not Earth, but the Moon. NASA sees it as a 'stepping-off point' for crewed missions to both the Moon and Mars, although some think it's a waste of money.